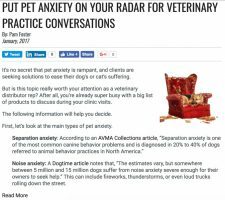 If you’ve had any of these concerns about your pet or veterinary blog, you’re not alone. Just about every week, I run into pet business professionals who are stumped when it comes to blogging, whether it’s finding the time for regular posts or knowing how to make it worth the effort. Just so you know, blogging is still VERY MUCH worth the effort. HubSpot, a leader in online marketing trends, revealed the power of blogging in its State of Inbound Marketing: 2012 Report on Inbound marketing practices & trends. 81% of businesses rated their company blogs as “useful,” “important” or “critical.” An impressive 25% rated their company blog as “critical” to their business. Retail and wholesale saw customer acquisition growth across every channel from 2011 to 2012. Company blogs were especially effective with 33% year- to-year growth. So what do these blogging facts mean to your website’s success? Your blog is a great place to add fresh, relevant content that attracts more prospects and customers to your website… IF it’s written to engage your audience and includes keywords people are using in search engines to find what you offer. For example, if you sell personalized pet gifts and your blog contains tips and ideas for clever pet gifts… that’s perfect. According to my keyword research, 405 people each month are searching for “unique personalized dog gifts” in Google, Bing, etc. That may not seem like a huge number, but wouldn’t you love to see 405 additional customers come to your website each month just from one blog post? It’s possible. And, you may be relieved to know you don’t have to manage all the blogging yourself. It’s no sin to have someone blog for you. Lots of companies use professional blog article writers, such as PetCopywriter.com, to manage it for them. So, what’s your barrier to blogging? Perhaps we can help. Until next time, here’s to a profitable pet website!